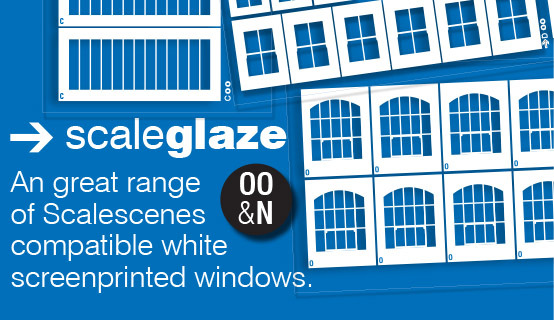 Professionally screen-printed on to graphic arts industry quality 100 micron (0.1mm) 100 gsm clear film, Scaleglaze is a simple cost effective alternative to the cut-out and printable windows supplied in all Scalescenes kits. 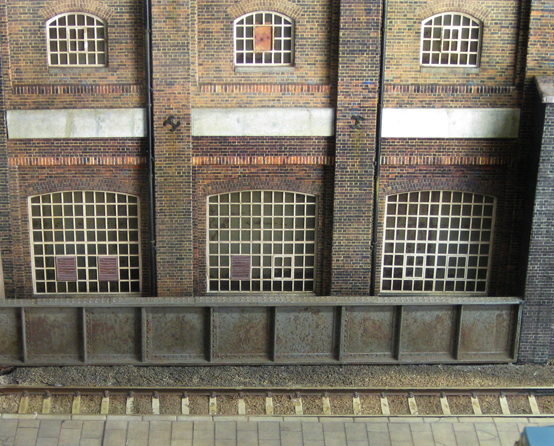 Scalescenes have also worked with Brassmasters to develop great range of compatible fine-scale etched windows and detailing elements in both N and OO scales. A usage, quantity and installation guide is available here. Spray paint the windows (both sides if visible on the finished model) on the fret. White aerosol model primer works well. Position the windows into structure. Ensure that you don’t apply the tape too far toward the centre of the windows otherwise it maybe visible when the windows are in place. A free ‘grime-covered’ window sheet designed to be printed on to inkjet or laser compatible film and placed behind the etched industrial windows is available here. The inclusion of one or two figures also adds another layer of interest to any scene. 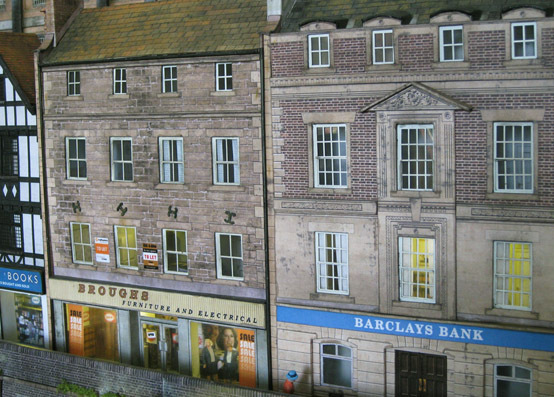 Whilst some of the interior detailing can usually be glimpsed under good layout lighting, to really finish the scene I recommend micro pre-soldered SMD Warm white LEDs. 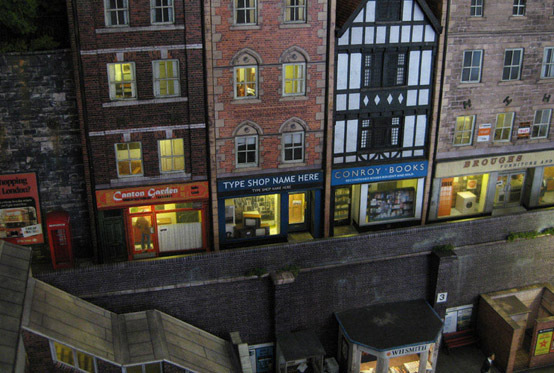 These can be picked up relatively cheaply online and are fantastic for squeezing into even small N scale structures. Black Cat Technology produce a range of handy LED lighting systems that include adjustable current limiters. Printing on to textured paper is a simple and potentially very effective method for adding subtle texture effects to your structures. The method works particularly well with stonework and roof tiles. Stick to papers that are specifically designed for use in laser or inkjet printers. Hammered or Laid finishes would work well (around 90 - 100 gsm). These are usually found in most office supply and stationery shops. A simple method to add surface texture to stonework is to carefully peel away the print on the base layers once the glue has dried. This generally leaves a uneven surface and delaminates the smooth top layer of the card. Once the cover layers are applied it should result in a subtle roughening of the stone surface. 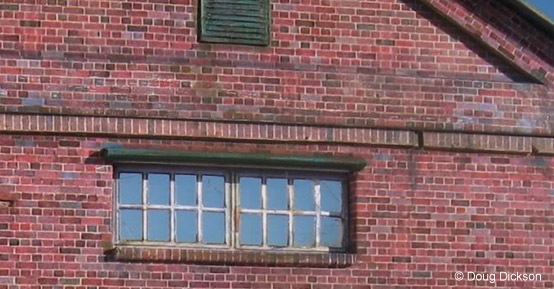 The odd 'missing brick' can really add character to an older structure. To successfully cut and pick out an individual brick takes a steady hand and more importantly a sharp blade (I recommend a No. 11 blade with a No. 3 handle). Once the brick has been prised out you'll need to mix up a small amount of matching paint and very carefully paint in the recess with a fine brush. With thanks to Doug Dickson for images and tips. I'm not really a big fan of the old rolled paper style chimney pots, especially when they can easily be created by painting any tubing of a suitable diameter (eg. brass, styrene, ballpoint ink tubes, cotton buds etc...) a red brown colour. 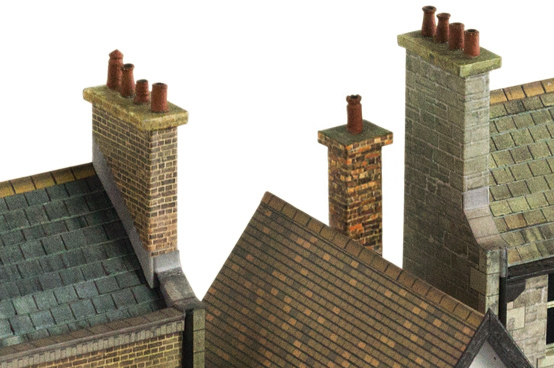 Alternatively an easier option are commercially available pots, Langley chimney pots (product ref: F111 for OO scale or A90 for N scale) work well. Drilling holes and squarely positioning chimney pots can be very fiddly especially when you want a realistic cluster of several pots. 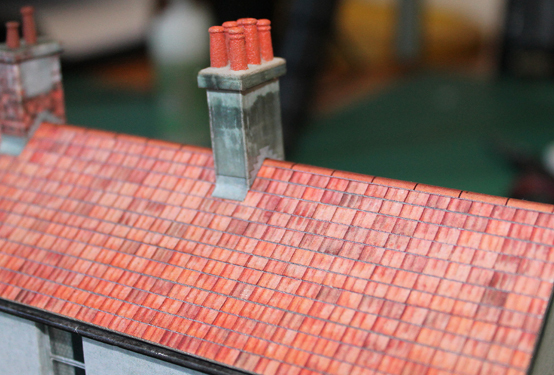 A lovely simple solution comes in the form of Model Railway Structures 3D printed chimney pots. 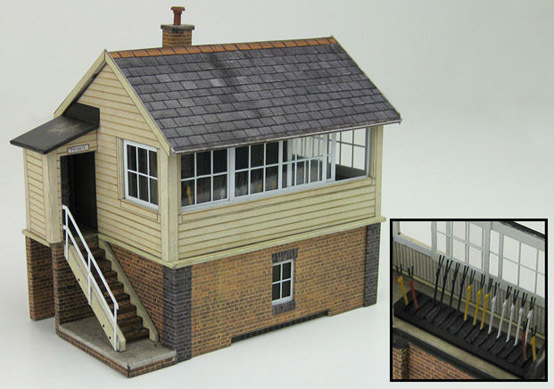 Designed specifically to fit many of the kits in the Scalescenes range, they have made it easy for you by printing groups of pots directly onto the mortar haunching, ready to install. As all the textures used in my kits are photographically based, most of the surfaces are 'pre-weathered' to a certain extent, so only a light application is really necessary for most scenes. Both weathering powders and black and brown artist pastel dust work well. A very soft make-up brush is ideal to gently work the powder into the corners where grime usually accumulates. As with all good things it's pretty easy to over do it, so build up thin layers slowly, don’t over do it! Test the technique on a piece of scrap wall first. 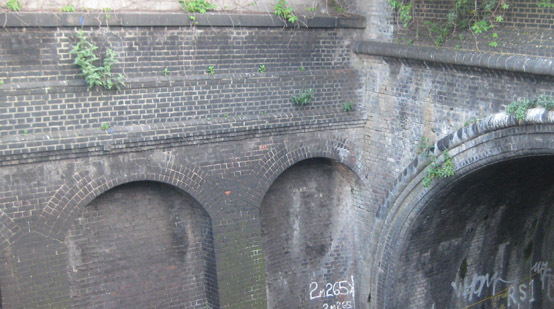 Limescale is always very evident along retaining walls, around tunnels and under bridges. It can be easily added by gently running a soft white pastel or chalk over the surface of the wall, carefully following a brick course. Next use a cotton bud to lightly smear the pastel down the wall. Repeat the the process a few of times in each spot to add depth and then apply a light coat of artist's spray matt varnish (shake the can well prior to application). Streaking can also be easily added by very lightly working blunt black and brown coloured pencils over the surface of the print in a downward motion. These streaks are then gently worked over using Tamiya Weathering Master pack B. It’s another quick and easy way to ‘tone down’ the richness of the print surface. An often overlooked aspect of weathering is the addition of moss and lichen. 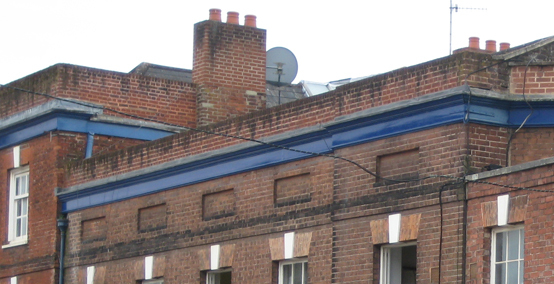 This is particularly evident along the top of wall coping and over roof tiles. Lichen and moss are surprisingly easy to add to structures, all that is required is an old 'OO' or 'O' brush and tubes of pale green and yellow ochre watercolour or gouache. Firstly stub the bristles to get a dappled patten then just lightly dab very small amounts of paint straight from the tube on to the surface of the structure. Test the technique on a piece of scrap first. With thanks to Doug Dickson for images and tips. Very small strips of medium and light green foliage can be worked along ledges, into the corners and along the base of structures. This really helps to conceal any ’slightly dodgy’ joins as well as softening the structure and 'grounding' it to the baseboard.